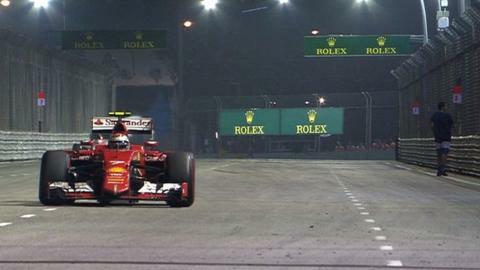 A British national who wandered onto the track at the Singapore Grand Prix on Sunday has been charged with committing a "rash act". Yogvitam Pravin Dhokia, 27, was seen walking along the side of the Marina Bay Circuit and taking photographs while the race was under way. His action caused officials to deploy the safety car, before he jumped back over a security barrier. F1 officials are investigating how he was able to get onto the track. At one point Ferarri's Sebastian Vettel, who went on to win the race, could be heard radioing his team to say: "There's a fan on the track, there's a fan on the track." Mr Yogvitam was offered bail of S$15,000 ($10,600; £6,800) but said he could not pay as he was not working and had spent all his money travelling to the Grand Prix, Singaporean media reported. He will appear in court again on 6 October. The British High Commission in Singapore confirmed the arrest of a British national and said it was ready "to provide consular assistance".